Going into a combat mission without an exit plan is suicide. In fact, the only soldiers who nev er bother with exit plans are kamikaze. On the other hand, market participants routinely enter positions without a clear exit plan. The problem is that as soon as we enter a position, our emotions impair our ability to make rational decisions. Greed and fear have a chemical signature. This is the first article of a series of four about exits and emotional mastery. When there is no exit plan, there is uncertainty about what to do next. A mild level of uncertainty can be exciting. A region of the brain Nucleus Accumbens (NAc) gets activated. This triggers the mesolimbic reward circuitry, often referred to as the dopamine reward circuitry. Dopamine is released. People take on more risk. By the way, cocaine, opiates and nicotine activate dopamine transmission. 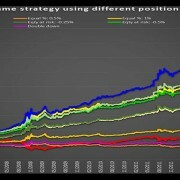 This is why just watching the portfolio feels a bit addictive sometimes. As Kuhnen and Knutson showed, risk seeking behaviors are often associated with NAc activation and high level of dopamine. In other words, Dopamine is the chemical signature of greed. When a few positions “go against us”, uncertainty turns from thrill to mild discomfort. We are more vigilant and come back to reality. When performance starts to suffer, uncertainty morphs into stress. 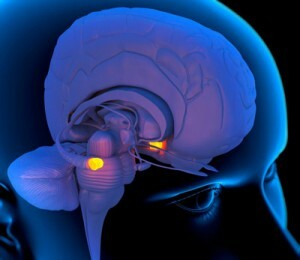 Stress triggers the amygdala, located in a primitive part of the brain called the limbic brain. Its primary function is to keep us alive at all times at any cost. It is always on. The problem with the amygdala is that it cannot discern between real danger and an imagined threat, between a saber tooth tiger and a -1% dent in the portfolio. At higher levels of stress, the amygdala activates the pituitary gland that releases cortisol. When cortisol is released, the neo-cortex or thinking brain is hijacked, game over. In his latest research, Daniel Goleman, author of Emotional Intelligence and focus, goes one step further. He describes a state of prolonged high stress as neurobiological frazzle: the thinking brain shuts down and physical health deteriorates. This is what we call burn-out. Bottom line, uncertainty has a destructive physiological signature. Uncertainty cannot be eliminated whether in life or in the markets. We can learn to 1) manage it and 2) reduce it. 2) Reducing uncertainty simply comes down to having plans and rituals or habits. One of the most important plans is the exit plan. When everyone else is stressed out, every bit of clarity counts. Unfortunately, every decision is an additional stressor. Every bit of stress reduces the mental bandwidth. This depletes the thinking rain of its capacity to make good decisions. This is called decision fatigue. Willpower is a muscle. An interesting study was done in Israel about parole decisions made by judges. Convicts examined before lunch were 2/3 more likely to be denied parole than after lunch break. Bottom line: if we do not want to look like deers in the headlights, we must plan our exits before entry. Experienced traders often say that the best time to put on a stop loss is 5 minutes before entry. Price goes down, there is a loss: at what price do we reduce risk ? How much do we need to exit ? Profit goes up, there is profit: At what price do we take risk/money off the table ? How much do we need to exit ? Price goes nowhere: how many days after entry ? How much do we need to exit ? Note also that exits do not have to be binary 0-100%. This is the subject of the next two articles. Note that there is no room for interpretation. This is not the time for abstract debates on valuations, long-term prospects, or any other rationalization that our amygdala fueled inner idiot will throw at us. It has to be an unambiguous IF…THEN sequence. It frees up mental space that can be used for higher cognitive functions: research and planning. Everyone knows that the key to success is to cut losers and ride winners. The problem is that no-one has ever come up with a formula. If You want a clear method to accomplish this, while maintaining your conviction, then the game of two halves is for you. Please register on our website. You will receive weekly & daily signals on Forex, all major equity indices and ETFs. Why is humility an essential trait of profitable short-sellers ? How do I overcome an addiction to forex trading? wanted to mention that I have got truly enjoyed browsing your site posts.